One of the traditional curry dishes in Kerala is mambazha kalan / mambazha pulissery. Its an easy to prepare side dish with minimum requirements which our grand mothers prepare in olden days. In those days mangoes very easily available in the backyard of every houses in Kerala. The dish is very sweet one. Its better if you can use nadan mangoes for this preparation as they are more sweet and fluffy. 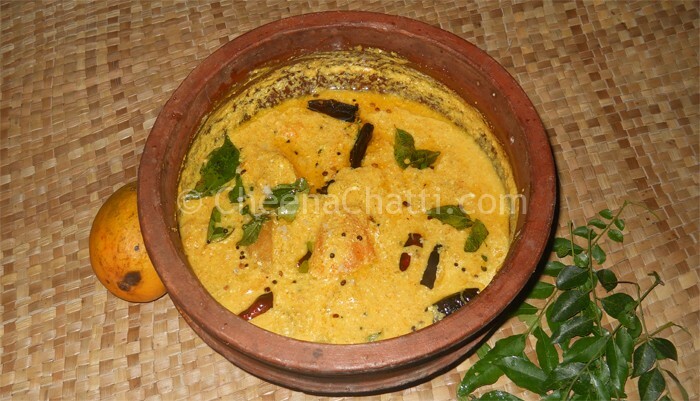 This is also a common dish in Kerala sadhya / grand feast. Don't forget to try our other mango recipes also. This entry was added on April 16th, 2013 by Cini P Moideen in Vegan and tagged with mango curry, kerala mango curry, manga pulissey, sadhya, mango, mango fruit curry, manga curry, sweet mango curry, mambazha pulissery. Last revised on April 4th, 2018.